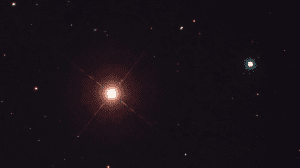 Fixed star Menkar, Alpha Ceti, is a 2.5 magnitude bright orange star on the Nose of the Whale, or Sea Monster, Cetus Constellation. The traditional name Menkar derives from the Arabic word منخر (manħar) which means nostril. Menkar is also called Menkub, Arabic mischir, in the Neck of the Whale. This star has a Saturnine character, corresponding to impediments of many kinds, worries, and tests of endurance; in some, this hardens and toughens the individual. In some cases with conjunction of Saturn, Mars or Neptune, diseases of the throat, inflammation of larynx, sometimes danger by suffocation have been noted. These people are advised to take good care of themselves if they have a tendency to throat trouble and to take prophylactic measures. They should avoid over-straining their larynx and, should they have special demands regarding the larynx, they are advised to take trouble in the methodical training of their vocal chords etc. 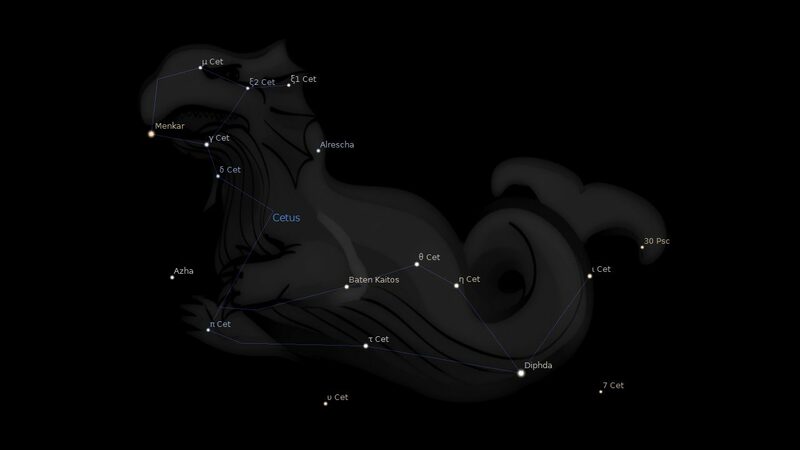 Midheaven conjunct Menkar: Disgrace, danger from cattle and large beasts. Henri Matisse 0°13′, Muhammad Ali 1°16′. Mercury conjunct Menkar: Difficulties through writings, difficulty in payment of mortgages, ill-health to marriage partner or relative, destruction of crops. William Lilly 0°01′, Rudy Giuliani 0°41′, Sid Vicious 1°19′. 1. Fixed Stars and Constellations in Astrology, Vivian E. Robson, 1923, p.38, 176. 2. Fixed Stars and Judicial Astrology, George Noonan, 1990, p.57. 3. Fixed Stars and Their Interpretation, Elsbeth Ebertin, 1971, p.12. 4. The Living Stars, Dr. Eric Morse, 1988, p.124. 5. The Fixed Star Health and Behavior Imbalance, Ted George and Barbara Parker, 1985, p.20. My Dad has this star conjunct his natal Saturn. Yes, definitely corresponds to his personality – to a T. Maybe sickness more so to the mind than the body though. Venus conjunct Menkar: Strong and uncontrolled passions, jealousy, domestic disharmony and temporary separation, ill-health of marriage partner. I have it again. My venus is in 13.45 degree.